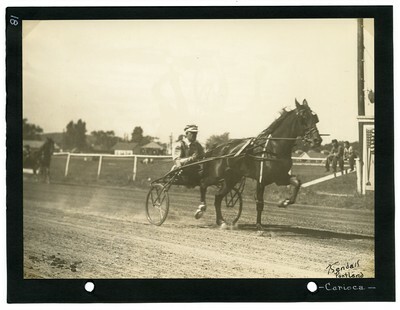 Sepia tone photograph of bay gelding Carrioca, Jordan up at the Maine State Fair in Lewiston, Maine, on Tuesday, September 7, 1937. Kendall identifies the horse as Carioca in his photo album. The photo is signed in the lower right corner by the photographer.